Had a fabulous Xmas and New Years eating and drinking our way through NYC. Our bdays were fab as well. 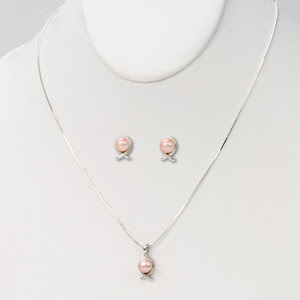 My brother and sister in law must have been peeping around on my site b/c for my birthday, they got me this necklace set from the Susan Komen Site! It's quite attractive on, and very professional! One a side-note, and this will shock some of you (especially you Auntie L! ), I actually cooked dinner TWICE last week and baked once! I think it was an all time record. I need some new simple recipes. If you have any good ones, pass them along to me. The husband gets so excited that it's fun to at least try. What about a great chicken recipe??? Anyone? Bueller? Just for fun, here's a pic of my crazy pooches barking at me right before walk-time. No peace in my household, and we don't even have kids!!!! Oh my God ... you cooked twice! Gotta be the Lemkin genes! The necklace is beautiful ... wear it in good health!